Compare and understand the IEEE standard 141 GE Flicker Curve and IEEE 1453 Flicker Meter standard. The main benefit Flicker Meter system is that the IFL, Pst and Plt values are numerical outputs provided at regular time intervals, which can be presented as graphs in power quality analysis software. 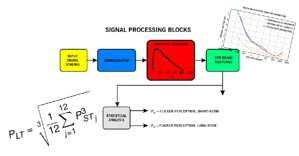 Time trends of long and short term flicker perception for the duration of the recording session can be viewed and printed to evaluate variations in flicker severity for individual customers. In addition, the more complex measurement is suitable for multiple sources of Flicker with complex voltage modulation. IEEE 141, GE flicker curve has served utilities reliably for many years and is still useful for evaluating simple load fluctuations from single flicker sources, the newer IEEE 1453 Flicker Meter standards provide an enhanced method for evaluating human perception of light flicker due to complex loads from multiple sources or customers with varying rates of occurrence. When investigating flicker complaints, utility personnel should include the IEEE 1453 Flicker Meter measurement when selecting initialization settings for power quality recorders. At the current time, IEEE 1453 standard has achieves broad acceptance and use, and as time goes on an increasing number of electric utilities are incorporating the improved method into standard practices for evaluating light flicker issues.